Located above most popular beaches in town (Banj, Tri mosta, Vela Luka beach), within 10 minutes walking distance from the beautiful Riva promenade, shops, restaurants and bars. World famous beach in Bol, Zlatni rat (Golden Cape beach) is only 30 minutes by car from Supetar. Supetar is easily accessed from City of Split by direct ferry boat in ca. 50 minutes sailing time. 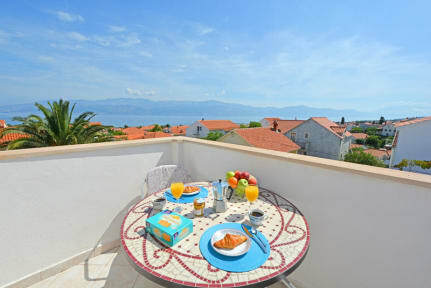 Apartments Sunce feature three elegant air-conditioned Two-bedroom apartments in the same building with communal ground floor terrace with sitting set. Every apartment in the building consists of living room with convertible sofa bed, TV, fully equipped kitchen and dining space, wi fi, shower bathroom, balcony with sitting set. 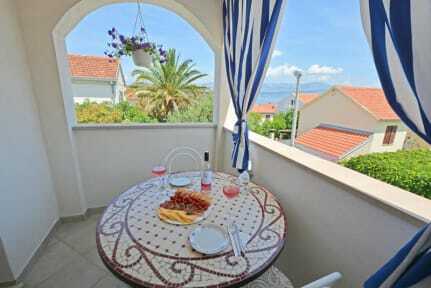 Individually designed and decorated, with fresh cotton linens and famous Dalmatian coastal ambiance. Bathroom towels and bed linens are provided. Check out from 04:00 to 10:30. The reception is open 09:00 to 21:00.